Below you can view all the homes for sale in the Washington Park subdivision located in Denver Colorado. Listings in Washington Park are updated daily from data we receive from the Denver multiple listing service. To learn more about any of these homes or to receive custom notifications when a new property is listed for sale in Washington Park, give us a call at 720-729-2320. Inviting front porch and fenced front yard too. MLS#6402086. Berkshire Hathaway Home Services, Rocky Mountain R.
*Renderings are of project in general and not of specific unit* Estimated completion: Spring 2019. MLS#7065817. LIV Sotheby's International Realty. *Renderings are of project in general and not of specific unit* Estimated Completion: Spring 2019 MLS#8079157. LIV Sotheby's International Realty. Charming Bungalow style side-by-side townhome*Original architectural charm and features*Walk to Veteran's Park, Wash Park shops and restaurants*6 blocks to Washington Park, 2 blocks to South High*Light and Bright*Updated kitchen and bath, appliances and cabinetry*New high efficiency furnace**Hardwood floors*Aluminum storm windows*Private covered patio*Fenced backyard*Plantation shutters*Newer roof*West facing front, corner lot*Large sprinklered garden area*Alley access garage*Great potential for finishing the basement*Turn-key, great for first time homebuyer or investor. MLS#7371173. A Better Way Realty. Don't miss this opportunity to live a stone's throw from the entertainment on Old South Gaylord and within one of the very hottest Wash Park blocks. MLS#5004879. Madison & Company Properties. If multiple offers are received seller will be leaving the home on the market through the weekend. Come get this great deal! MLS#2073886. RE/MAX Cherry Creek. Don't miss this opportunity to enjoy the Wash Park and Park Lane lifestyle. MLS#6907244. Re/Max Urban Properties. 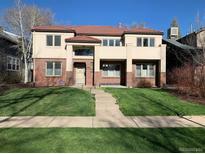 Walkable to shops, restaurants and one of Denver's most coveted parks, Washington Park, you'll enjoy walks along the tree lined streets of this one-of-a-kind home! MLS#7104230. LIV Sotheby's International Realty. Burning wood in Denver is rarely allowed and the wood burning fireplaces have not been used by the current owners, and are sold as-is. Better hurry on this one! MLS#3407189. Preferred Properties Inc.
There’s no lack of storage in this home and plenty of unique spaces to enjoy between the breakfast nook with floor-to-ceiling windows, the three-season porch, the private deck off the master suite and the large basement. MLS#9539234. Thrive Real Estate Group. *Renderings are of the project in general, not a specific unit* Estimated completion: Spring 2019 MLS#2821146. LIV Sotheby's International Realty. Check out this home with three bedrooms on upper floor, original hardwood floors and a two car detached garage on a generous sized lot. This location is unparalleled!! ! MLS#8056613. Porchlight Real Estate Group. Be a part of this wonderful neighborhood, just blocks to Washington Park, Cherry Creek, Bonnie Brae Ice Cream, and the shops and restaurants on South Gaylord! MLS#7608259. Porchlight Real Estate Group. Beautiful Home On A Quiet Block! Must See. MLS#7326941. RE/MAX Professionals. 2 car detached garage with additional parking pad. MLS#2603182. COLDWELL BANKER RESIDENTIAL 18. Sun-filled living room and additional guest room with full bathroom. MLS#7297188. HomeSmart Cherry Creek Properties. So much to offer in this classic! MLS#2826028. COLDWELL BANKER DEVONSHIRE. Your dream home in a dream location! MLS#3814244. Keller Williams Integrity Real Estate LLC. Restaurants, retail & one of Denver's most renowned parks are just moments away! MLS#3907735. RE/MAX Cherry Creek. The location cannot be beat near all of the shops and restaurants on South Broadway, Whole Foods, and Sprouts MLS#2793119. Compass - Denver. Rare chance to own a classic home on this quiet, close-knit block in the heart of West Washington Park! MLS#1908064. RE/MAX Cherry Creek. The meticulously maintained grounds includes lush landscaping with large patio, pergola, and built-in gas grill. MLS#3079406. LIV Sotheby's International Realty. Large 2 car garage and additional storage shed. MLS#6008341. LIVE URBAN REAL ESTATE. This luxurious urban gem is located in the Washington Park & South Broadway area***Back yard for your BBQ off the main floor kitchen & a Skyloft for fabulous entertaining with unobstructed views of the city and mountains*Love the wall of 2-story South facing windows, High-end Kitchen-aid appliances & wide plank site finished wood flooring throughout the main floor*Plenty of space for full size Dining & Great Room*Home offers a Mezzanine level which is perfect for you to work "remote" or use as gaming area*Display beloved art pieces or your book collection, too*Upstairs offers 2 spacious bedrooms & 2 full baths with wide format tile and over-sized shower*Detached 2 car garage provides tons of extra space for your weekend gear*Close to shopping, urban eateries, pubs, salons, Washington Park & Cherry Creek*Walk to some of the best restaurants, get a massage nearby, or take your best friend on a walk around Wash Park*Builder nominated for prestigious "Mame Award" for design 2017/2018. MLS#5178044. Coldwell Banker Residential 26. With close proximity to Cherry Creek, Denver’s premier restaurant and retail hub is just a short walk or drive away, allowing for a lifestyle rich in options and accessibility. MLS#4846487. LIV Sotheby's International Realty.